WHAT HAPPENED TO MY EAVESTROUGHS / GUTTERS? 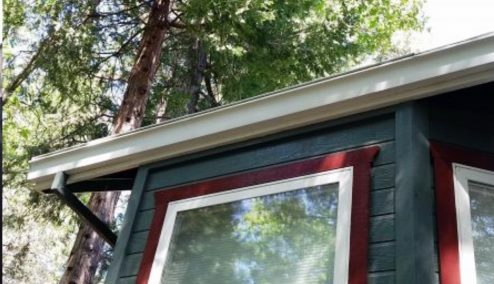 “Tiger Stripes” is the term commonly used to describe the unsightly lines that form over time along the face of the eavestrough / gutters. “Tiger Stripes” are rarely due to a problem with the paint, but rather a natural build up over time. Pollution and dirt continuously gathers on the top lip. 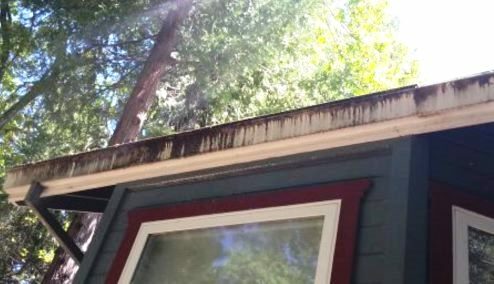 When there is enough moisture, a drip is formed, runs down the face of the eavestrough / gutter and starts the process of dark vertical lines. Water tends to run along the same path over and over and, in time, the contrast between light and dark becomes very evident. The result? “Tiger Stripes”. If you have personally ever tried to remove these unsightly stripes, you know first hand how difficult these stains are to clean. Pressure washing does not work. Soap and water does not work. 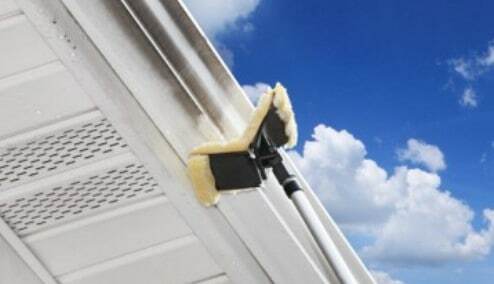 As long as the paint on the eavestroughs / gutters have not been ruin by excessive oxidation, they can be returned to their original and beautiful state, however, it requires cleaning products and equipment specifically designed to tackle this natural phenomenon. Such products are very expensive, however, when compared to replacing the eavestrough / gutter system, the savings is HUGE! Additionally, such products are very dangerous to the environment, not to mention human health and the process to actually do the cleaning is very dangerous without the proper equipment and tools. At Toronto Clear View Window Cleaning, we use a safe Non-Toxic, Non-Hazardous, Biodegradable, Non-Flammable, Non-Abrasive, and Non-Corrosive unique cleaning product and system. Conclusion: The cleaning results of Toronto Clear View Window Cleaning’s unique Eavestrough / Gutter Whitening service will astound you. The before and after results are truly remarkable and can only be appreciated when seen. Try our Instant Quote Calculator. This enables you to immediately find out the cost of rejuvenating your eavestroughs / gutters. Voted Toronto’s Best Window Cleaning and Eavestrough / Gutter Cleaning Service Company. Enjoy “Peace of Mind” with our “You Don’t Pay Until You Are 100% Satisfied” policy. TORONTO CLEAR VIEW WINDOW CLEANING INC.